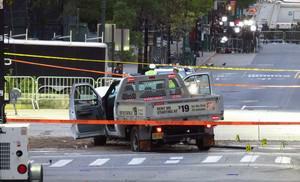 TerrorismPolice foil possible terror truck attack outside Washington, D.C.
A Maryland man has been arrested for an Islamic State-inspired terror plot to run down pedestrians with a stolen truck. Federal prosecutors will argue in a court appearance Tuesday that 28-year-old Rondell Henry should remain in detention pending trial. They said in a court filing ahead of the hearing that there are no conditions under which Henry could be freed and be assured of returning for future court appearances, and that he represents a threat to the community. Prosecutors allege Henry stole a truck from a suburban Washington shopping mall last month and drove around looking for terror targets. After failing to breach security at Dulles International Airport, Henry is accused of driving to the National Harbor in Maryland — a Potomac River walkway lined with shops and restaurants, highly popular with tourists. Police arrested Henry the next morning after he climbed out of a docked boat in which he hid all night and jumped over a security fence. The government said that Henry sought out videos of terrorists beheading civilians and fighting overseas. He “considered these gruesome actions brave and he wanted to emulate them,” the government said. The government also said that because Henry, a computer engineer, had no weapons training, he was planning to emulate the 2016 ISIS truck attack in Nice, France, which killed eighty-six people. They say Henry has a “hatred for those who do not practice the Muslim faith” and wanted to emulate those he saw in videos beheading civilians and fighting overseas. So far, Henry faces charges of interstate transportation of a stolen vehicle. It is not clear if he will face additional charges. The Washington Post reports that shortly after Prince George’s police arrested Henry on charges of breaking and entering, law enforcement committed him to a hospital for emergency psychiatric services, according to two law enforcement officials familiar with the case. Henry was taken into federal custody as soon as he was cleared from the hospital on April 3, the individuals said.